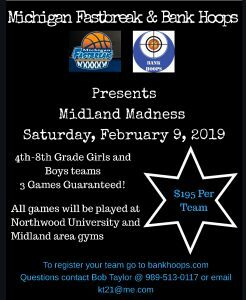 The Midland Madness Tournament will be held February 9, 2019 at Northwood University and Midland Dow High school, for grades 4-8. The entry fee is $195 per team, with a three-game guarantee. Games are reffed by MHSAA certified officials. Winning teams will be featured on Bank Hoops. Fill out the following form to register for the Midland Madness Tournament.